This is originally a recipe I developed for Pinto Magasin last year. It’s a perfect Easter brunch recipe and a must for any mushroom lovers. The cashew filling becomes crunchy while baked in the oven which is a perfect addition to the soft mushroom. It’s a simple and very fitting recipe for Easter. Rinse cashew nuts and soak the nuts in a bowl of water overnight. Add nuts, garlic, lemon juice, herbal salt and cilantro in a food processor. Blend until smooth. Add water and olive oil while the food processor is still running. Continue to mix until you get a smooth and firm mixture. Taste the mixture and add more salt or lemon if preferred. Brush the mushrooms to remove any dirt. Remove the foot from the cap of each mushroom. Place the mushroom caps on a baking tray covered with baking paper. bake in the oven for about 15-20 minutes at 225 degrees C. (Depending on size, keep an eye on the mushrooms while in the oven). 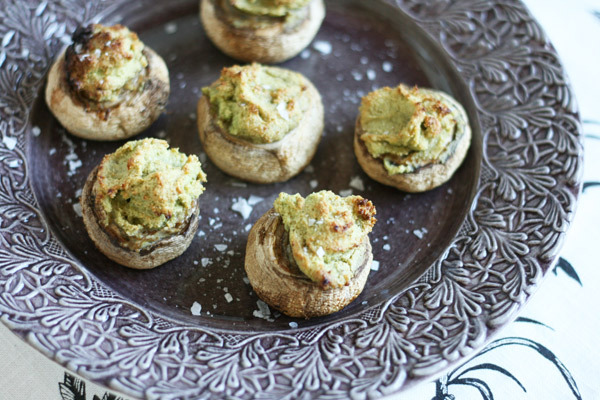 Sprinkle a little sea salt over the mushrooms prior to serving. Yum I’ve been experimenting lately with cashew “cheeses” and the like so this has to go on my list of must tries. Wow! Intrusting recipe to cook. And also it is very clear with great explanation. I want to try this recipe at this weekend. Thank you for sharing your amazing views with us. Thank you again.